This year I was invited to create the Miss Multiverse Australia national costume for our AU representitive Gabrielle Keaton. For this project I also had my partner Zoran, of zoran architecture, help me. He digitised some of sketched sections, portians of the Opera House into CAD files ready to 3D print while I took care of the sewing and freehand 3Doodler 3D printer pen extruded components. 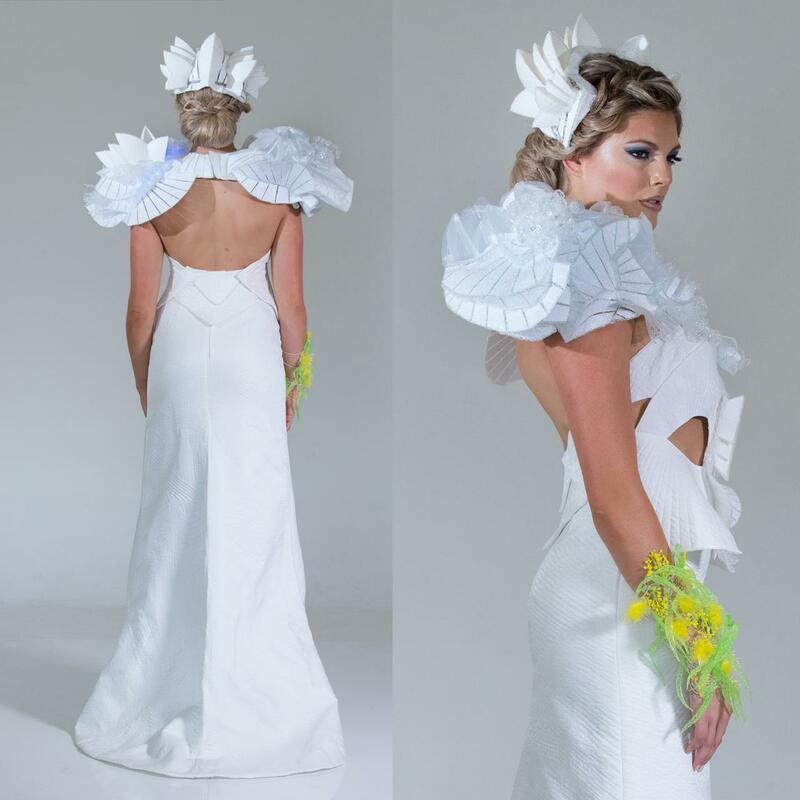 The dress, headpiece & arm cuff took just over five weeks to complete, with some of the machine 3D printed pieces taking 24 hours to print. I also machine quilted my interpretation of the chevron tile patterns, which adorn the surface of the Opera House onto the skirt. which on it's own took over a week full time to complete. Once all of the sections where complete, I assembled them together and the whole dress emerged. A dress reflecting some popluar Australian landmarks including the Sydney Opera House, the National Native flowering Golden Wattle and the World Heritige Site the Great Barrier Reef. Erica Gray is an award winning soft sculpture and wearables artist with an interest in traditional sewing techniques as well as technology based and infused methods, often having both processes merging into her art pieces. She utilises elements such as freehand extruded printing, machine based 3D printing, synthetic materials as well as incorporating Augmented Reality and Artificial Luminescence effects. Her work has been displayed nationally and internationally in events such as the World of Wearable Art Awards Show in New Zealand, BDYHAX tech/fashion Texas, as well as the Paradigm Gallery + Studio, both in the USA. There have also been a number of exhibitions within Australian regional galleries and events, with the most recent being Townsville's 2017 Strand Ephemera exhibition where Erica took home the “Award for Artistic Excellence”. An Artist in different forms, Zoran Zivanovic, director and owner of Zoran Architecture, is also an award-winning architect based on the Gold Coast, Queensland. Having over 30 years of experience behind him in the architectural field, he holds a strong bond for the design, detailing and construction processes Architecture entails, and also has a deep interest in all things technology. His greatest interest is in the blending of technology and architecture… more so the processes for design, visualisation and pre-construction rather than the implementation of technology within construction. His design thesis “The Evolution of Virtual Cities” was his first foray into this meshing, and has followed on with other interests such as Virtual Reality, 3D Visualisation, 3D Printing, Software Coding and Circuitry. Not all things need to be Architectural to peak his interest, hence Erica and Zoran have also collaborated on fashion art pieces such as the “Big Bang to Being Bra”, “Symbiont” and other pieces to varying degrees for events such as the World of Wearable Arts and the sARTorial event as part of Vivid. These pieces are often a mix of freehand extruded modelling, CAD designed and 3D printed forms, lighting, sensors and non-conventional materials. Continued collaboration between the two should see an unique blend of wearables, arts and design in the near future.